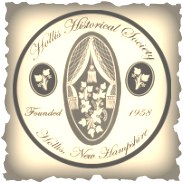 In 1949, the ladies of the Hollis chapter of the Daughters of the American Revolution discussed the possibility of forming an organization in Hollis with the Selectmen of the town that would have the responsibility of preserving the artifacts and the moments of the history relating to the town for the future. The same year, there was a warrant relating to form a committee for this purpose, and, in 1951, the library was selected to store any important items that were accumulated. When Elizabeth M. Proctor, a descendant of the noted Moses Proctor of Proctor Hill in Hollis, died in 1957, she left a legacy to the town of Hollis, including furnishings that belonged to her family, and a sum of nearly $7,000 to preserve them. As a result of this inheritance, on June 13, 1958, twenty-five residents met and unanimously voted to form the Hollis Historical Society. 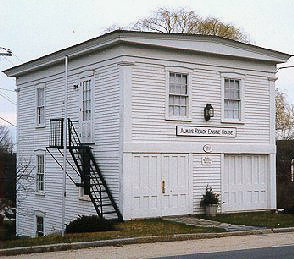 In 1979, Ruth Hills Wheeler left her house at 20 Main Street to the Hollis Historical Society, which is now the headquarters and one of its museums. In 1993, the Lucie Beebe Garden, located behind the Wheeler House, was dedicated. This lovely garden is maintained by the Colonial Garden Club of Hollis. In 1989, the Hollis Historical Society leased the old Engine House, built in 1859, from the town of Hollis. Thanks to many volunteers and hundreds of hours of work, the “Always Ready” Engine House Museum was established in 1994. The first floor exhibits include the Defender hand drawn pump and wooden parts from the horse drawn “Always Ready” engine. Also on display on the first floor is the beautiful fully restored horse drawn Hollis hearse. There is also an area devoted to the Veterans of Hollis. The top floor has a permanent ﻿pictorial history of Hollis, plus displays that are changed every year. Enthusiasm and awareness on the part of the townspeople of Hollis for discovering cultural and historic treasures has increased greatly in the last few years, as evidenced by the large numbers that attend all events sponsored by the Hollis Historical Society. In 2011, the Hollis Historical Society collaborated with Beaver Brook Association, the Hollis Heritage Commission, and the Souhegan Valley Chamber of Commerce in hosting a “Strollin’ and Rollin’” event. In appreciation for planning the event, the Society was awarded the Crystal Eagle Award by the Freedom’s Way Heritage Association at its annual meeting.